I may not have an opportunity to post a July outfit after I get home from Switzerland so I’m going to get this one in early. 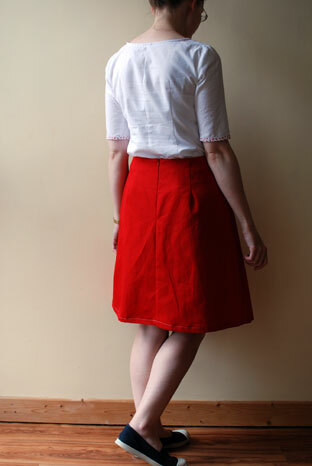 I wasn’t kidding about the red skirt! 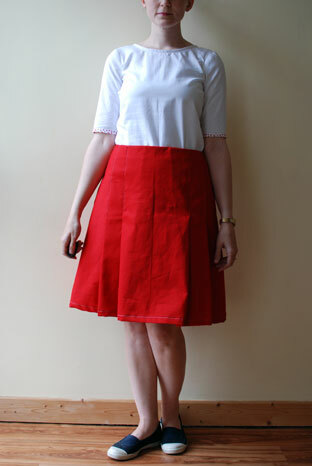 The pattern for the skirt was the same one as here. I bought a metre of this for €8 at Murphy Sheehy’s, thinking that I would make shorts, but changed my mind when I got the skirt pattern. I managed to squeeze it out of the metre but had to put the zip in the centre back. It’s quite a hefty cotton drill so I hope I will be able to wear it into Autumn. The top is the Colette Laurel pattern. The nice thing about this pattern is that the top and dress are given as separate pattern pieces. This meant that I was able to cut a much smaller size for the top than I would want for the dress. I cut a size 0 and made some small adjustments. For a start, I took about 1/2″ out of the top of the sleeve cap. The back neckline gaped a lot so, rather than put in small darts (which is what it needed), I used the back centre seam to taper out a good 1.5″. I shortened the bust darts by 2cm. I wore the top to visit a friend yesterday and found that, though it is comfortable, the back of the neck is lower than I prefer and the armscye is higher than I would like. I think Colette patterns are for a slightly different, larger figure than mine and that certain ‘fits’, such as their pants rise and armscye depth, don’t scale down perfectly. 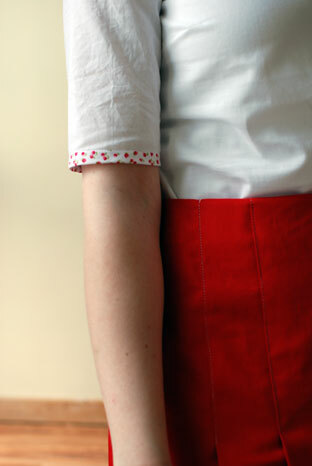 That said, I love their style and it’s unreasonable to expect every pattern to fit without tweaking. I am spoiled by vintage pattern petite fit! I bought the cherry bias binding from Rubanesque about two months ago (a quick google gave me this result where you will not only find cherries but other dotty delights too) and bought it without purpose. I had hoped to have it show on the neckline but it sat so oddly, I had to turn it in and stitch it down. 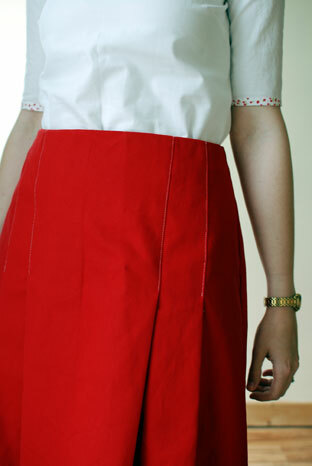 I decided to go with white top stitching on the skirt. This was partly to match the top but also because I didn’t have any red thread! Overall, this was a very quick outfit to make – about three sessions in total – and I’m really looking forward to wearing it into Autumn.